Forecast Discussion: Wednesday, increasing cloud cover will limit ozone formation in Louisiana. In addition, south-southeasterly winds will aid pollutant dispersion. Therefore, AQI levels will be Good. 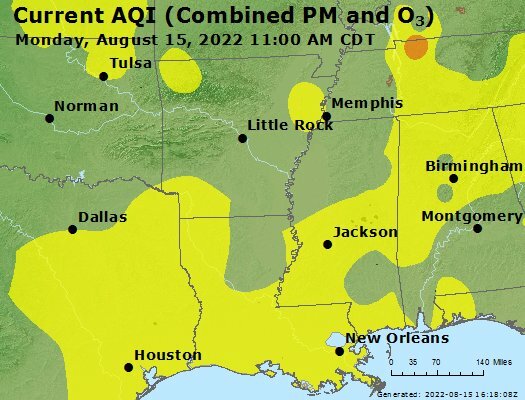 Thursday, as a cold front moves into the state, moderate winds and widespread thunderstorms will keep pollutants well dispersed, yielding Good AQI levels. Friday, moderate northerly winds behind the departing cold front will disperse pollutants and transport clean air into Louisiana. As a result, AQI levels will continue to be Good.